Some breaking news out of the world of Sports Car racing. 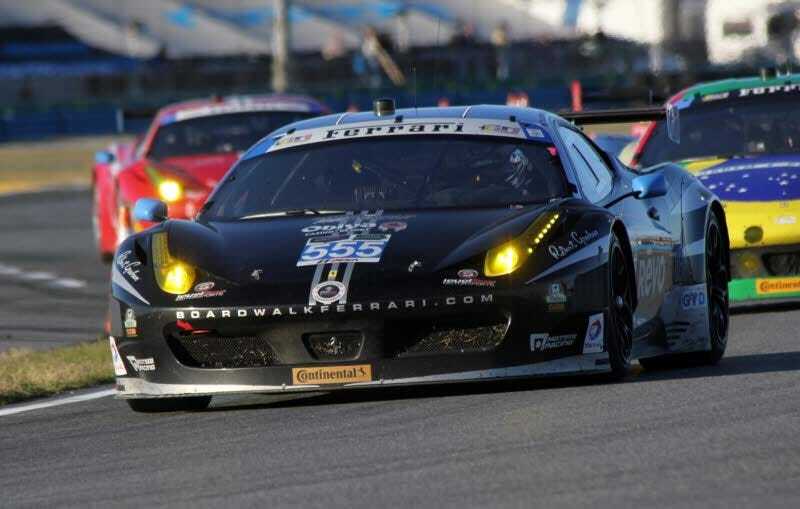 Level 5 Motorsports, the two Ferrari 458 Italia's, that won the season/series opener of the newly created Tudor United SportsCar Championship have pulled out of the entire series. The team headed by David Stone made the decision to leave the series this Monday according to FoxSports. The team had won the opener at Daytona outright but were handed a penalty for avoidable contact, which gave the victory to the #45 Flying Lizard Audi R8. However, the penalty was reversed after a few short hours giving the win back to Level 5. Stone cited various reasons why the team was pulling out of the new TUSC series, but stating that he felt that "we should not have been in the 2014 to begin with because of it being a development year for the series," and "as was apparent, the time frame that was taking for them to provide rules, driver rankings, etc". He also cited the apparent size of the grid as being too much for the race to properly run. He stated that the series as a whole needs time to "sort itself out" and that Level 5 doesn't want to endure through the teething issues that this new series has to overcome. Given the massive rule changes this season, and the switch from AMLS to TUSC, the new grid of cars, new drivers from different disciplines, it's a wonder that the inaugural race of the new TUSC went off without more drama. Granted the massive crash between Memo Gidley and Matteo Malucelli was a very large hitch, the race went on without much drama after that. Both men are considered to make a full recovery. And Memo's team, Gainsco/Bob Stallings Racing has also pulled out of the rest of the season due to financial strain and concentrating on Memo's recovery. The team lost their primary vehicle in that crash with not much of the car being able to be salvaged. However, unlike Stone who has not elected to say when or even if the Level 5 Ferrari's will be back anytime soon, the Gainsco crew have stated that they are looking forward directly to 2015 to come back. Now Leo Parente of the /Drive network had an open discussion on this new series right after the Daytona and told us that we should all hold our judgment's until we see more of the racing. But with a high profile team electing to pull out, indeed the Class leaders of GTD, will we possibly see more? Stone states that there needs to be more team accountability in respects to making decisions about the overall direction of the racing series, and until then, those directing it will put both driver and fan alike aside for what is more profitable. He, like I do, want to see a return more to the style of racing in AMLS or WEC. I felt that putting in the DP's and regulating the Prototype Classes heavily so that most of the teams left for WEC was a mistake. The fan's wanted to see those Prototype Classes, they were fascinating cars, and the racing was epic. I watched the first race and well it was rather boring in my opinion, and I find myself agreeing with Stone. I do think that TUSC can recover and rally the loyal fans and even interest new ones, but it's going to require much deliberation on what those organizers are actually shooting for. Are they trying too hard to appeal to the NASCAR crowd, or should they strictly focus on the old AMLS crowd. Level 5 racing leaving the series is a huge step backwards for TUSC, and I am not sure how the future will play out or if other teams may leave the series. As of right now the only certainty is that there will be two less Ferrari's duking it out on the track and that is a sad day indeed.